Donald Trump steps to the podium to introduce his wife, Melania, during the opening day of the Republican National Convention in Cleveland. There has been a lot of polling over the past few days in advance of the Republican National Convention, which got underway Monday in Cleveland. But it mostly confirmed the conclusion our election forecast models had arrived at late last week: Hillary Clinton leads Donald Trump by 3 or 4 percentage points. That’s down from a lead of 6 or 7 percentage points a few weeks ago. But Clinton remains ahead of Trump in the clear majority of polls. She leads by about the same margin that Barack Obama did heading into the conventions in 2008, and by a somewhat larger margin than Obama did in 2012. I’ve nevertheless detected a lot of consternation among Clinton voters: Why isn’t her position safer? There’s really about a 35 or 40 percent chance that Trump will become president? The flip side is that the recent polls could just as easily prove to be a low-water mark for Clinton. Conventions have oftentimes helped the incumbent party’s candidate. One of the biggest turnarounds came in 1988, when Michael Dukakis, the upstart winner of the Democratic nomination, held a lead of 6 or 7 percentage points going into the conventions. But a well-staged Republican convention in New Orleans helped to unify the GOP and highlight the successes of George H.W. Bush and Ronald Reagan, and Bush eventually won by a landslide. What’s relatively safe to say is that we’ll know a lot more in a month or so. Below, you’ll find a comparison of where national polls stood heading into the challenging party’s convention, and then 30 days after the incumbent party’s convention.1 (By tradition, the incumbent party — Democrats this year — holds their convention last.) The pre-convention polls missed the final margin in the race by an average of 6.4 percentage points. By contrast, the post-convention polls missed it by 4.0 points, a considerable improvement. And since 1972, they’ve gone 11-for-11 in identifying the winner of the popular vote. But there are a couple of important caveats. One is that the conventions are being held much earlier than usual this year. There are 103 days between the conclusion of the Democratic convention on July 28 and the election on Nov. 8. By contrast, there were just 61 days separating the conventions and the election in 2012. The campaign is going to feel really long, and there will be several extra weeks for the poll numbers to gyrate around. By far the more important qualification, however, is that while you should be keenly interested in what the polls say a month or so from now, you ought to be careful in the interim. That’s because the conventions have historically been associated with large, but sometimes temporary, bounces in the polls. Walter Mondale briefly moved into a near-tie with Ronald Reagan in 1984, for example, in an election he eventually lost by 18 percentage points. In recent years the size of convention bounces has declined; instead of bounces that sometimes ran into the double-digits, they’ve been more like 4 percentage points instead. The bounces have also become harder to measure because, beginning with the 2008 cycle, the incumbent party began to hold its convention immediately after the challenging party, instead of waiting several weeks. That doesn’t give a lot of time for pollsters to measure the challenging party’s convention bounce. It would be a bad sign for Trump if he can’t at least tie Clinton in polls conducted in between the RNC and the DNC. Since recent convention bounces have averaged 3 or 4 percentage points, and Trump trails Clinton by 3 or 4 points now, that would suggest he’d had a below-average convention bounce. And it would certainly be a bad sign for Clinton if she doesn’t lead after her convention, since she both holds the lead going into the conventions and gets to hold her convention last. Beyond that, you should read the polls with some caution over the next few weeks. Convention bounces may not be as crazy as they once were, but in both 2008 and 2012, the incumbent party came out “hot” after the conventions. John McCain and Sarah Palin briefly pulled into the lead in national polls after their 2008 convention in Minnesota, but that bounce soon dissipated. In 2012, Obama’s lead peaked at about 5 percentage points after the conventions, and it proved to be more durable, although still with some fluctuations along the way. 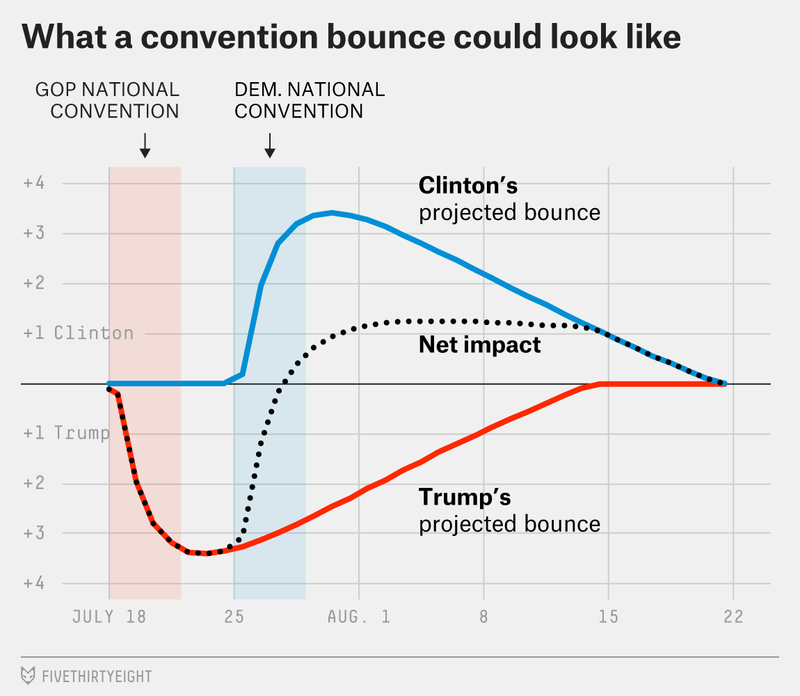 As far as tracking the convention bounce, we’ll give you a couple of options. Our “fancy” model, polls-plus, will apply a convention bounce adjustment as described in our methodology primer. Our simpler model, polls-only, will take the polls as they come. Keep in mind that there are other differences between these models — for instance, the polls-plus forecast is based partly on economic conditions, while polls-only isn’t. We’re going to make sure to cite both models frequently as we consider the effects of the convention bounce. If you’re an action junkie, you might also follow our now-cast, which also takes the polls at face value and does so very aggressively, with Clinton and Trump’s win probabilities sometimes shifting by 5 or 10 percentage points in the basis of a single good poll. The now-cast is too manic to provide for a reliable forecast of the Nov. 8 vote. But if Clinton or Trump emerge with big convention bounces, and you want to terrify yourself or dream big about how they might look on the map, it can be a fun tool. Specifically, I took a simple average of national polls in the 30 days before the challenging party’s convention, and then an average of national polls taken 20 to 40 days after the incumbent party’s convention. If a pollster surveyed the race multiple times during these intervals, I took an average of all instances of the poll instead of including every version of it.